2013 food distribution begins | United Food Operation, Inc.
United Food Operation, Inc. has begun its 31st annual food distribution program in Kanawha and Putnam counties. Pictured at the announcement, from left to right, are Drema Ward, of Five Loaves/Two Fish food pantry, Nitro; John Roberts, of Mountain Mission, Charleston; Elaine Harris, UFO chairperson. 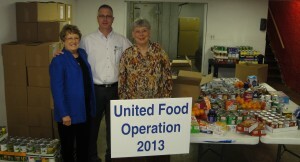 United Food Operation (UFO) kicked off its 31st year of winter food distributions this morning. UFO will supply 13 independent food pantries in Kanawha and Putnam counties from January 4 through March 23. 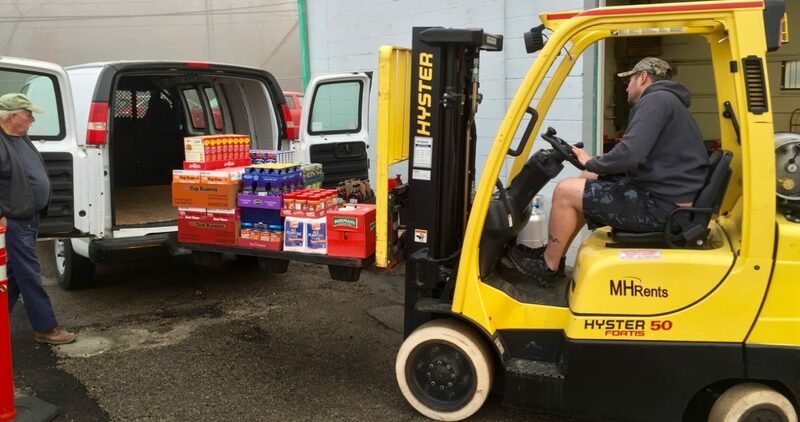 “This year’s food distribution program is dedicated to the hard work of 13 local food pantries partnered with UFO,” said UFO Chairperson Elaine Harris. “Food pantries are the front line in fighting hunger in our communities, and that’s why UFO is dedicated to helping stock food pantries so they can continue to fight hunger in our region,” said Harris. Harris said additional public support is needed this winter if the pantries are to be able to meet the need. People can volunteer their time or make a donation of food or funds to UFO or to a local food pantry. “Increasing the number of workplaces participating in collections of money and food could really help our 13 local food pantries this winter,” said Harris.